Calling all artists! 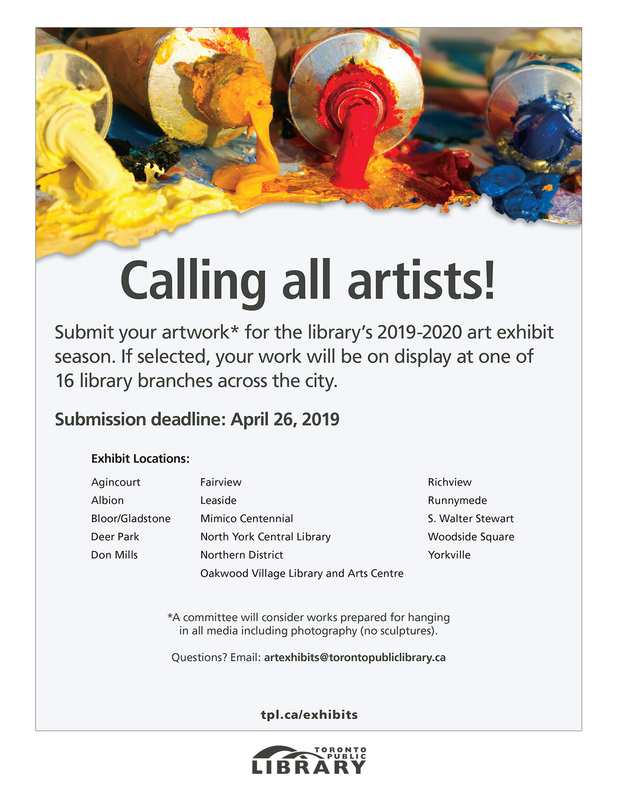 Submit your artwork* for the library’s 2019-2020 art exhibit season. If selected, your work will be on display at one of 16 library branches across the city. *A committee will consider works prepared for hanging in all media including photography (no sculptures). Download the application available on this page or visit: https://www.torontopubliclibrary.ca/programs-and-classes/exhibits/art-exhibit-space.jsp for more information on applications and exhibitions. The Learning Zone is accepting exhibition proposals for two exhibitions in the Winter term, one in March and one in April 2019. Exact dates can be flexible to the needs of artists and curators, but we are looking to fill our calendar from March 4th to April 23rd. Applications will be accepted until the dates are filled. With a large glass wall facing the first level of Village by the Grange, the Learning Zone Main Space provides an excellent opportunity to have your work seen by the OCAD U community and the general public. Due to the flexibility of our space, we can accommodate a broad variety of formats: two dimensional, three dimensional, installation, performance, audio or video work. The Learning Zone encourages submissions from all areas of study at OCAD University, including undergraduate and graduate students, faculty, and alumni. We accept proposals for solo and group exhibitions. Students who wish to curate an exhibition of student work are also encouraged to apply. Don't be intimidated, we're here to help make your exhibit idea a reality! We can provide support in exhibition planning, installation and more. Our application process is simple and easy. Students or Faculty interested in planning an exhibit in the Learning Zone should contact LZ Librarian, Marta Chudolinska at mchudolinska@ocadu.ca with the following information: Medium and theme of work to be exhibited, Approximate number of pieces to be installed, Potential dates of interest, Program of Study & Year Level. Volunteer at EDIT: Expo for Design, Innovation & Technology. September 28 - October 8, 2017. There are awesome perks for the volunteer team. Come Up to My Room is grassroots. It’s where ideas are born. It’s where people come to take part. It’s accessible. It allows art and design to collide, unite, melt, disagree, catch a cold, get better, hold a grudge, spread a rumour, take risks, fight and make up. What differentiates the artists and designers who show at CUTMR each year is their willingness to take risks, to push their ideas, to evoke meaning not just function. They’ve been working for months. They will transform all four floors of the hotel with their site-specific installations that challenge the ideas of art and design. All year the excitement has been building. Designers have been revealing their projects to us. Layer by layer. Room by room. This curatorial process is ephemeral, gaining shape only as we move closer to the event. We want it like that. We ask for it like that because we need this experience to be a surprise. We still don’t know what it will look like, what direction everyone took—and we won’t know until the doors open..
Thirteen…an unlucky number for some, but not for Come Up To My Room (CUTMR). This year’s event, the thirteenth edition, once again showcases the work of new and established artists, designers and collectives from Canada and the US. CUTMR encourages spatial exploration that engages our senses, our memories and our perceptions of reality. Framed within the backdrop of the historic Gladstone Hotel, CUTMR invites participants to inhabit three floors with site-specific, immersive installations that stimulate the imagination and encourage discussion and dialogue between contributors and visitors alike. Coming from the fields of architecture and exhibition design, this year’s curators, Jana Macalik and Nuria Montblanch have reengaged with the heritage of CUTMR, focusing on the spatial sensory experiences and design as the medium. The designers have been encouraged to identify discursive opportunities, altering perceptions of space and place. The inclusion of designers’ own identities within the experience of the exhibition affects narratives and is reflected in their use of interactive and tactile media. Thus, a space of discourse is created where multiple dialogues can begin to take place – between the hotel, the spaces and the people within. An exhibition celebrating Flash Forward's 10th anniversary curated from OCAD University photography alumni who have been past winners of Flash Forward. Saturday October 25, 6 to 9 p.m.
Urban change is inevitable, as is our ambivalence towards modernization and the possible loss of heritage which accompanies it. During the second half of the nineteenth-century, Paris was re-imagined and a structure of wide boulevards constructed to crisscross the network of older streets. It was Charles Marville's task to document in photographs what Georges Haussmann slated for demolition. In this illustrated lecture, photographer Peter Sramek discusses his process of revisiting Marville's sites to record the changes of the past 150 years and to speak with today's Parisians about how the city continues to change in some of its oldest neighborhoods. The exhibition Charles Marville Photographer of Paris, is on view at The Metropolitan Museum of Art from January 27 to May 4. Peter Sramek studied photography at MIT under Minor White and has taught at the Ontario College of Art & Design University in Toronto since 1976 where he is currently Chair of Cross-Disciplinary Art Practices. Sramek’s work incorporates silver photography, digital imaging, handmade books and video installation. His works are in many collections, notably the Musée Carnavalet (Paris), Toronto Archives, Art Gallery of Hamilton, National Library of Canada, the Allan Chasanoff Collection (NY) and MOMA (NY). Exhibitions of his rephotographic projects include the French Institute of Prague and Gallery 345 (Toronto). Recent group exhibitions include the Korean Cultural Centre, Beijing and the New Delhi Art Fair. Sramek's black and white silver photography currently explores European historical sites incorporating rephotographic strategies, working from historical archives. Piercing Time: Paris after Marville and Atget 1865-2012 is based primarily on the Marville collection at the Musée Carnavalet and has been supported by a Google Research Award, as well as funding under the GRAND National Centres of Excellence Research Network (Graphics Animation and New Media). A book of this title has been released by Intellect Books/University of Chicago Press. Photo: Charles Marville's view of Rue Tirechappe from 1865 (left), which was replaced by Rue du Pont Neuf as seen in Peter Sramek's photograph taken from the same spot in 2009. Shore Lunch is a multi-site art venue that takes the form of a camp kitchen. Inspired by stories of my Mother's fishing skills and her love for pulling up on an island and frying up fish over a fire, I created this project to think more about the layers of history, the interaction of waterfront leisure areas and industrial hubs around the Great Lakes. I'm camping out for a while to acknowledge the different kinds of sustenance we get from this place. With assistance from artist Kip Jones, cook Shannon Myers and millwright John Myers. Part of Harbourfront Centre's Fresh Ground new works commissioning programme. June 29 and July 1: 1 to 2 p.m. Listen To This includes a musical performance by Melody McKiver and Lisa Myers. Due to construction on Queens Quay, driving down poses some challenges but if you go eastbound along Lakeshore to lower Simcoe Road and turn south (towards the water) you will be able to get to a parking garage on the east side of the road. Or if you travel west bound on Queens Quay you can turn south directly into the Harbourfront parking garage. Common Fate is an algorithmic performance. Animations, music and a series of dances cycle through one another, creating distinct three-minute performances. As the show unfolds, the solos are combined into duos, triplets, and full-cast choreography, while musical themes layer in the increasingly complex live score. Watercolour animations provide a dreamlike cast to the bodies in motion, projected environments that shift between the concrete and symbolic. What seemed tragic in one context becomes laughable in another, what appeared silly takes on depth. We perceive individuals moving in parallel paths as a unified group, regardless of any actual connection between them. In moments of harmony and dissonance, we invent meaning from an empty plot. Common Fate features performances from Amelia Ehrhardt, Emily Law, Julia Male and Chelsea Omel, with music composed and performed by Isla Craig, Brodie West and Andrew Zukerman. I Will Tell You Exactly What I Think of You is an emotional endurance test, a talk show where the host is there to work out her desires and prejudices, using the audience as a cipher. Simultaneously fulfilling and questioning the urge to see oneself reflected in another, the audience seeks something of themselves in the answers. Self-selecting as guests, they submit themselves to a public reading from a stranger bound to tell them exactly what she thinks of them. SummerWorks marks the first time this popular work will be performed as a live-streamed web-series in front of a studio audience. Like a rollercoaster, you take your seat and hold on until it’s over.